The other classes include the blaster, who gains d6 HD, 1/2 BAB-progression, good Will-saves, 4 + Int skills per level and proficiency with simple weapons and another light melee weapon, which gains “an attack bonus” that scales with the level – it’s small issues with the rules-language like this that can be seen The blaster also is an arcane spellcaster, who gains spellslots according to a unique table, which goes up to 8th level. The governing attribute is Charisma, though the spellcasting is prepared and based on a spellbook. The unique part of the class would be that it has the option to convert spells into blasts of raw eldritch might, dealing 2d6 untyped damage per spell level. As a minor hiccup, while the ability does note the ability is supernatural, the header lacks the (Su) that should be here. They also get an ability to make analyzing their spells harder to understand and thus counter. The class once against sports a selection of techniques to modify the respective blasts etc. – with advanced (11th) and supreme techniques (20th) being unlocked at later levels. The untyped damage is pretty nasty, and so is the significant spell arsenal – the class is the one in the arsenal that hasn’t aged well – the kineticist or the ethermancer represent better, more balanced options for the blaster trope. The third class would be the brawler, the fighter-equivalent, who gets Improved Unarmed Combat at 1st level, full BAB-progression, d10 HD, 2 + Int skills per level, a bonus feat at 1st level and every even level thereafter as well as proficiency with all simple and martial weapons, all armors and shields (except tower shields) and no firearm proficiency. They gaina combat pool equal to 2 points +1 for every 2 levels thereafter, which can each round be assigned to attack rolls, weapon damage rolls, AC, and Will-saves “Willpower saves” here) – this is a simple, but fun ability. Speaking of minor hiccups – the Knowledge (Xcrawl)-skill in the class skills here lacks the (Int) that’s supposed to be after it – again, cosmetic, but there are quite a few glitches like this. The messenger gets d8 HD, 2 + Int skills per level, 3/4 BAB-progression as well as good Fort- and Will-saves, proficiency with the deity’s favored weapon, simple weapons, all armors and shields (except tower shields) and 2 domains and prepared spellcasting based on Wisdom. Messengers are directly descendant from the divine and their blood can act as a holy symbol. Basically, this represents a variant cleric who does not gain channel energy and instead gets an array of abilities at 1st, 9th and 13th level. This would btw. be as good a place as any to note that formatting of attributes is inconsistent – I noticed quite a lot of lower case attributes like “wisdom” and the book is inconsistent in whether it uses the full-length attributes or the three-letter abbreviations. The class write up also features a table of domains etc. for the Olympian pantheon, some of which have abilities that made me seriously question how they got past playtesting. The ability “On my signal”, in the Strategy domain, for example, allows for the no-action (not even an immediate action!!) activation at the start of a combat round: Wisdom bonus + 1/2 class level allies can act on the highest initiative count among the allies (not sure if the “ally” has to be part of the chosen group). I assume that the action is instead of the action usually available at this round. Still, this allows for the old rocket-tag game; bonuses to initiative are very potent and this collective boost, usable 3 + Wisdom modifier times per day, can provide devastating initial assaults. At the same time, not all of the classes and player-options hold up well and sport some unfortunate hiccups – to the point, where, if I rated this as a crunch-book alone, it would not fare well. At the same time, systems like the glorious mojo pool or the cool fame engine represent fun subsystems that are extremely hackable. The majority of the classes were honestly not to my liking and crunch-wise, I’d consider this to be a mixed bag. However, the setting and the idea, the concept, make this at the same time a book I’d love to praise to the high heavens. 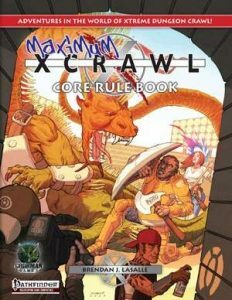 Xcrawl is pretty amazing if you get it, if you take it in the spirit it is intended; if you’re looking mostly for crunchy bits, then this probably won’t hold up as well, as that aspect is simply not as refined. I am really torn here – between wanting to complain hard and praising this book, it’s hard to find an official verdict. Ultimately, I’d love to rate this 3 stars for the issues in rules-language and formatting…and I’d love to rate this 5 stars + seal of approval for being simply one glorious setting, with great supplemental material. In the end, my official verdict will clock in at 4 stars – if you’re looking for the setting, if the idea intrigues you and if you cherish ideas more than precision in the details, then get this ASAP – Xcrawl is unique, fun and thoroughly inspiring. This is one of those that my group playtested. It was a lot of fun over the year that we did.